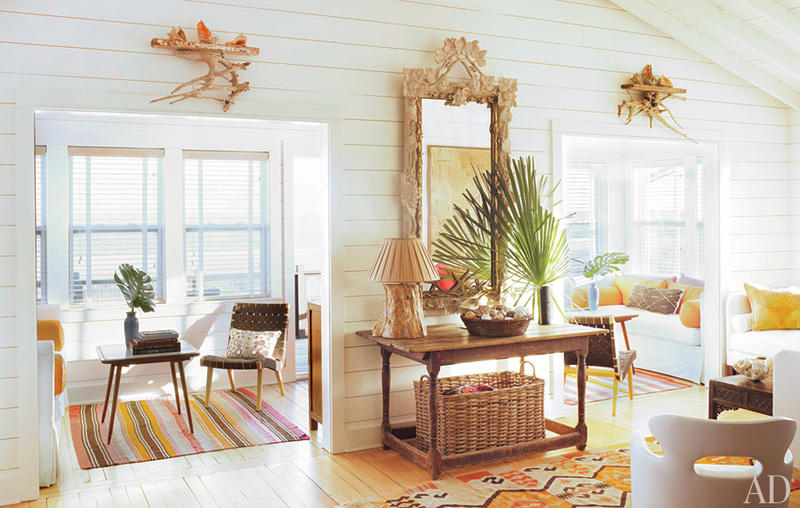 Mix and Chic: Home tour- A beach bungalow in South Carolina! 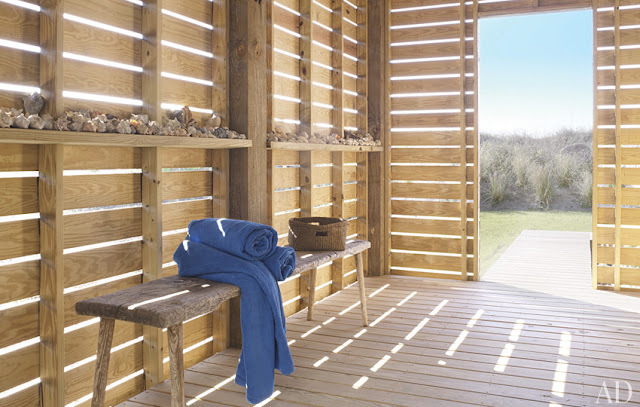 What are your thoughts on this beautiful beach bungalow? For me, I find this bright and airy home very casual, comfortable and relaxing. 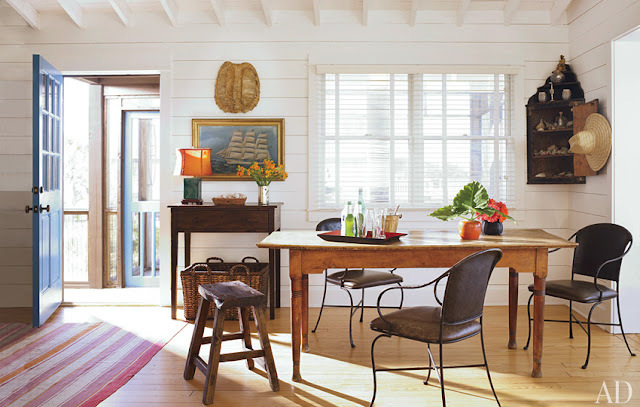 The addition of wonderful features such as the high vaulted ceilings and the white plank walls creates a relaxed charm in this oceanfront retreat. 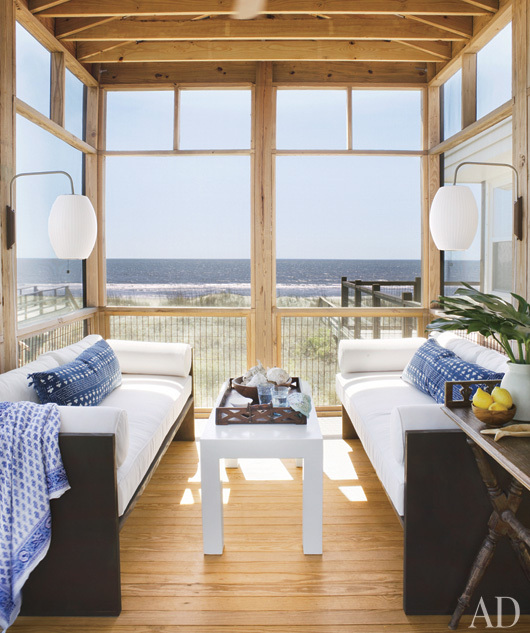 My favorite room is the sitting area and the screened porch. Which one is your favorite? 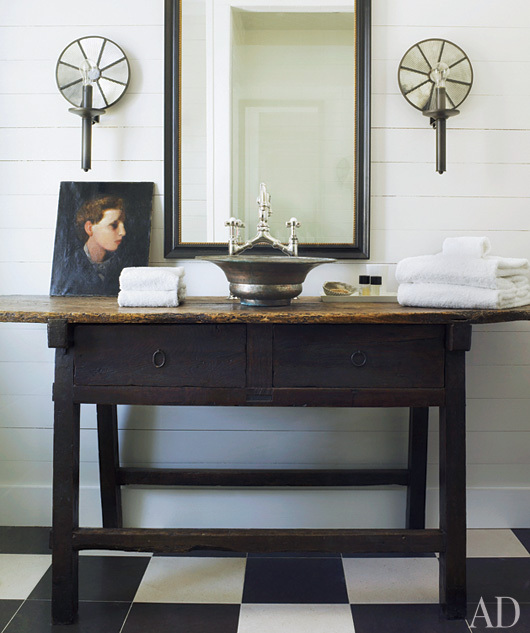 This is a simply beautiful house- it's relaxing and casual yet sophisticated. I love that hallway with the different patterned floors and the orange living room. Amazing! SO pretty ! I want this entire place. The bedroom is so gorgeous...look at that suzani. And I love the living area in the first two photos...the rug is gorgeous ! I like the colourful patterened rugs in this space best. Nice place, Jessie! Hubba Hubba....I am in LOVE. Jessie, that is my kind of beach house. For real, I love everything about it! 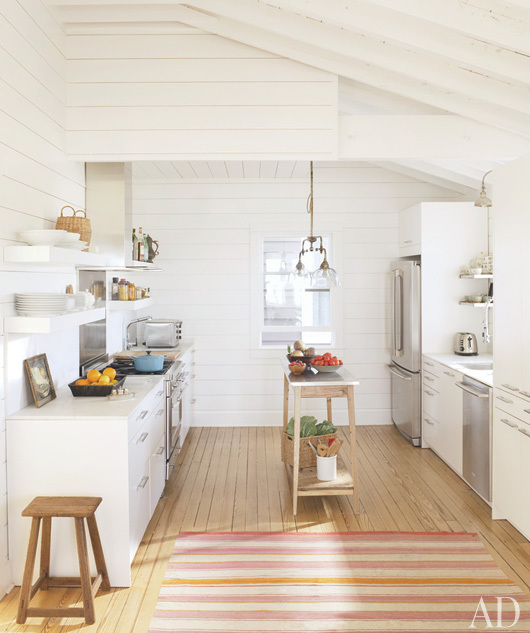 i love all the white and bright! I want that gold antique mirror! Also swooning over the beautiful blue dresser. 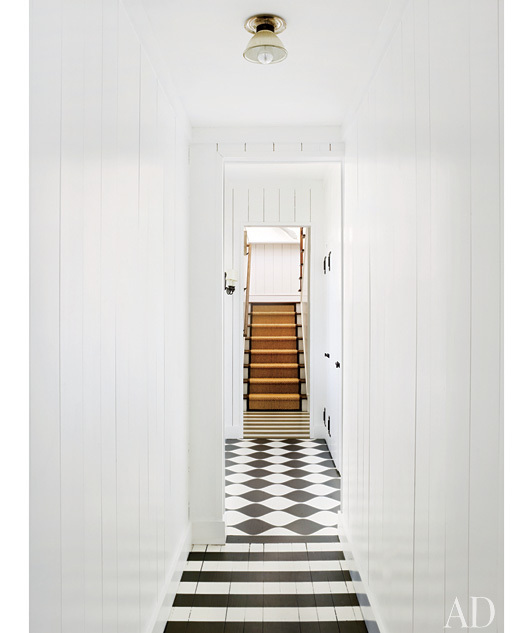 I just love a painted floor, everything here seems so bright and airy. Ahh - so stunning!! fantastic! 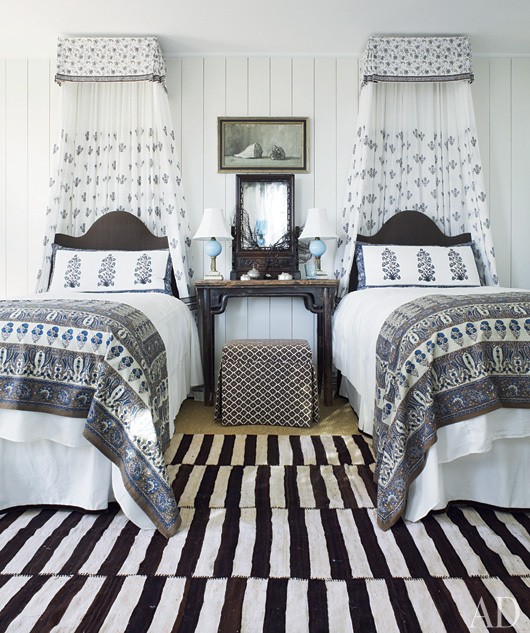 I espcially love the black and white twin bedroom - so casual and beachy but still so global! Hey Jessie!! first off..i love that pic. of lady with sunglasses on!! btw..where do you find these amazing homes!!?? thanks for visiting our blog today! i got my ottoman at Home Goods for like $75.00!!! seriously AMAZING..right!!?? Jessie - thanks for your sweet comments about my house on 6th Street Design School. So happy to discover your blog! 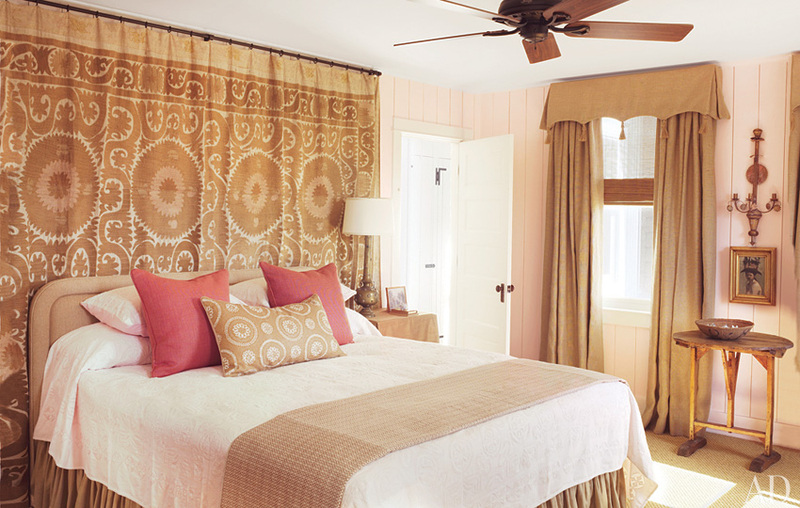 That beach bungalow is fabulous... the painted floors and the guest bedroom (with striped rug) are my favorites. 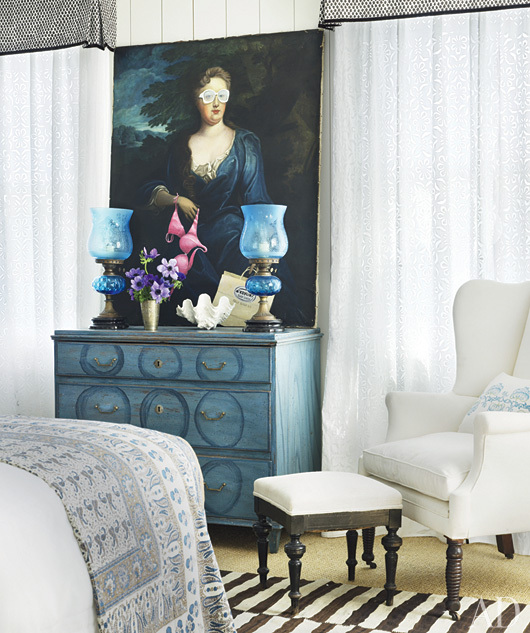 That bedroom has so many things to love - that wacky painting above the blue chest - the pretty valances - the crisp white wing chair. I would be a very happy guest in there!